The Hi studio in Memphis is one of the key locations for southern and deep soul of course and there almost too many wonderful recordings begging to be covered. One of the areas of music that the late Willie Mitchell wasn't so involved in was male vocal group soul but bviously there honourable exceptions to this rule like T-99 who cut just the one 45. For years many fans thought that the Willie Walker who recorded as a solo artist for Pawn and Hi might have been involved in this disc. And thanks to pioneering research by my friend Martin Goggin we now know that he was indeed the lead singer. The other group members were Thomas Brady who penned this fine tune, and Ingram Munn and Milton Tolton. Sweetness Ain't Sweet No More is a beautifully arranged piece of deep soul balladry superbly sung. The strings are just enough to add some tonal colour but not enough to swamp the vocalists and Hi Rhythm are their usual immaculate selves. A side to treasure.Walker has made it clear that in his view it was Mitchell's refusal to back the group with promotion or support that effectively ended the group. 1. Special thank to Martin Goggin whose excellent interview with Willie Walker in Juke Blues 54 provided most of the facts on this page. Thanks also to Dickie Tapp who came to my rescue just in time. 2. " 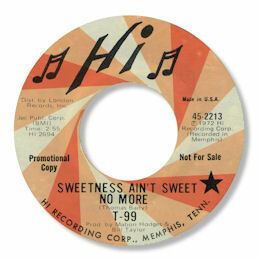 Sweetness ain't sweet no more" can be found on the Hi UK CD "Forgive this foolish man".